Shipping companies are starting to experiment with cleaner fuels and cutting-edge technologies. Here are some of the brave, new ideas in green shipping. Big changes start next January, though, when long-debated standards from the International Maritime Organization (IMO) mandate steep cuts of sulfur emissions associated with respiratory disease and acid rain. Much tougher rules are supposed to take effect in 2050, when the IMO will require ships also reduce carbon dioxide emissions by at least half. A.P. Moller-Maersk is considering using a modern version of the old-fashioned sail to help power its ships. 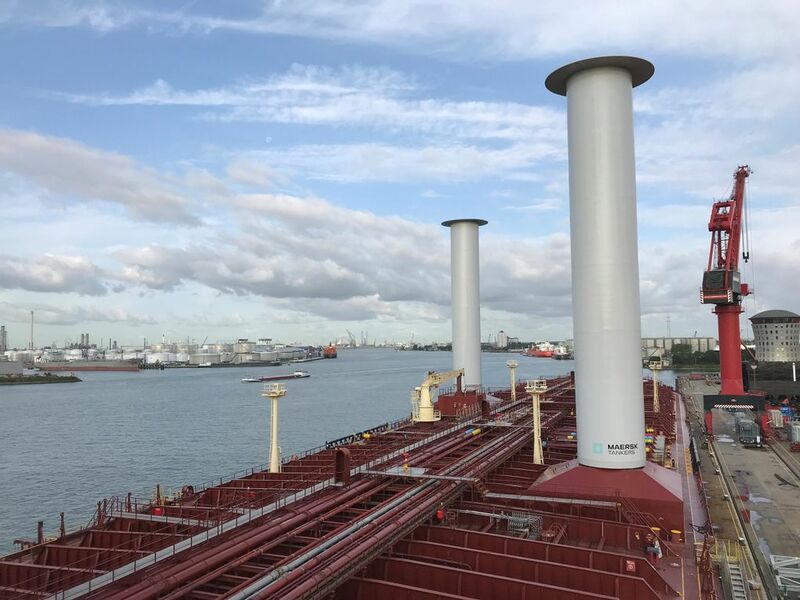 The devices, which are being tested on one of Maersk’s giant tankers, look more like huge marble columns than anything you’d expect to see on a traditional yacht. 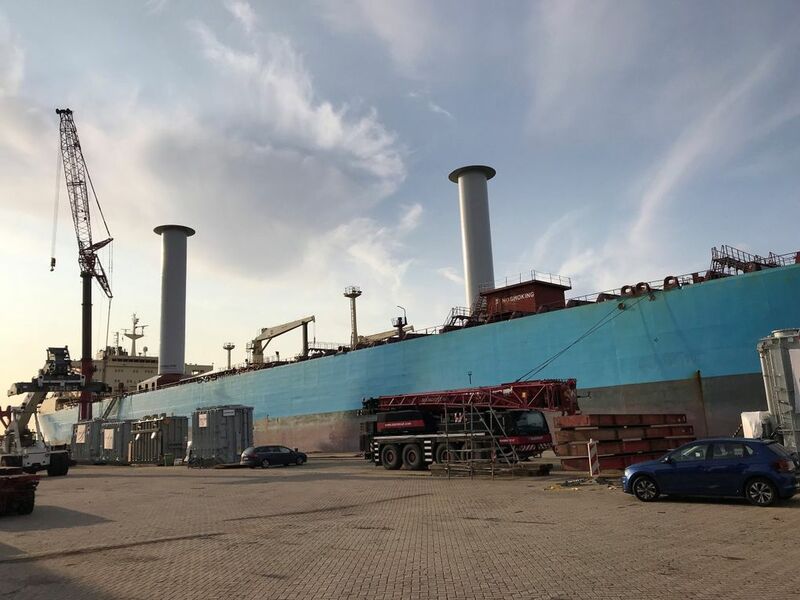 Together, the two 10-story-tall cylinders can harness enough wind to replace 20 percent of the ship’s fossil fuels, according to Norsepower Oy, which makes them. Just as carmakers fine-tune the aerodynamics of their vehicles to get better gas mileage, shipbuilders also try to reduce the friction between a vessel’s body and the water. Optimizing hull shape is one strategy. Another, being tried by firms including Samsung Heavy Industries and Mitsubishi Heavy Industries, is streaming bubbles out of tiny holes in a ship’s underbelly, as a lubricant, to help it slice more cleanly through the water. It’s a little like floating on a carpet of air. Samsung says it’s already installing the system on one vessel being built for Mediterranean Shipping and has received two other orders. The technology can cut fuel consumption by 4 or 5 percent, according to the company. The world’s biggest shipbuilder, Hyundai Heavy Industries, last year announced it’s developing hydrogen-fueled engines for its massive vessels. The technology is in its infancy, but some proof of concept may come later this year when a small ship being billed as the first fuel-cell passenger ferry, the Water-Go-Round, begins operating on San Francisco Bay. Hydrogen-based ferry systems are also planned in Norway and Scotland’s remote Orkney islands. In Norway, where the government wants two-thirds of all ferries carrying passengers and cars along its Atlantic coast to be electrified by 2030, Kongsberg Gruppen is offering battery-powered ship engines and developing a short-haul electric container vessel. A Chinese-built ship launched in 2017 on the Pearl River, near Hong Kong, was the first fully-electric cargo carrier of any size, according to China State Shipbuilding. The vessel is emissions-free, but even with batteries sufficient to power three dozen Tesla sedans, the 2,000-ton ship can travel only about 50 miles without recharging, says the China News Service. Makers of the devices, such as Finland’s Wartsila and Sweden’s Alfa Laval, say there’s already a big backlog of orders, so many ships won’t be outfitted in time for the 2020 rule change. Bloomberg NEF estimates some 4,800 vessels will be scrubber-equipped by 2025. Marine gas oil is already used in Emission Control Areas, like the ones around Europe’s coasts, but using it full time to meet the new emissions rules will cost shipping companies an extra $40 billion to $60 billion annually, according to Goldman Sachs Group and researcher Wood Mackenzie. Liquefied natural gas is another option, but the cleaner fuel requires whole new engines and port facilities to store it. In 2016, Nippon Yusen launched the world’s first LNG-powered car carrier and last October a Russian supertanker the length of several football fields crossed the Baltic Sea, running on the condensed gas. Bloomberg’s Sharon Cho, Gregory Turk, Dan Murtaugh, Dong Lyu and Hannah Dormido contributed to this report.